Nerd Wig; Nerd Wig Includes: Wig. Not Included: Glasses. One size fits adults and teens. 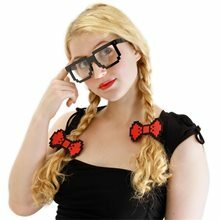 Nerd Kit.Includes: Glasses with tape, bow tie and plastic pocket pen holder.Available Size: One Size Fits Most Adults and Teens. *Shirt, Pants, Shoes and Belt Not Included. Accessories Sold Separately.Material: 100% Polyester. (Exclusive of Decoration)WARNING!! : Keep away from open flame. 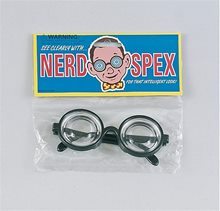 Not intended for use in play by children under 14 years of age.Made in China. 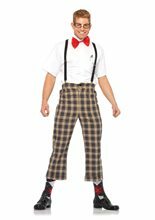 Nerdy Ned Adult Men Costume; Nerdy Ned Adult Men Costume 4 PC. 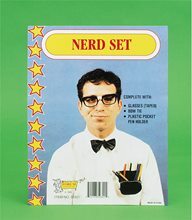 Nerdy Ned, includes high water plaid pants, suspenders, bow tie, and taped glasses.